The daily global consumption of crude oil is about 93mn barrels. At a price of around USD 100 per barrel, prevailing between 2010 and the beginning of 2014, approx. USD 9,3bn was paid by consumers to the producers on a daily basis. Per year, that amounted to approx. USD 3,400bn. Against that benchmark, at today’s price of slightly less than USD 50 per barrel, a total of USD 1,700bn is saved by the consuming countries. 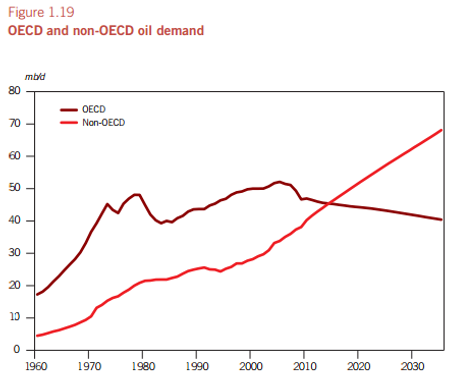 OECD countries account for about 40% of consumption – generating savings for them of about USD 680bn per year. Strangely, that windfall hasn’t led to a huge consumption or investment hike in those countries. To the contrary, it is very likely sitting in no yield deposit or government bonds held by a population too scared to move. On the other hand, there is reduced consumption and far further reduced investment activity in the oil producing countries. Countries like the UAE or Russia who were recycling most of their oil revenues into purchases from OECD countries buy far less, if at all. Mad world it is where a big boost to available income in OECD countries leads to effectively zero effect. Simply shows that giving people more or cheaper money does not create demand.